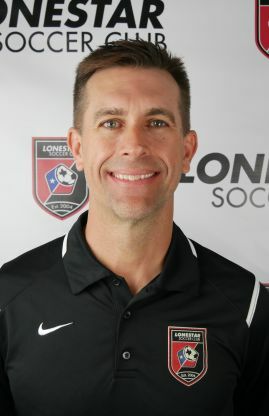 Ron joined Lonestar SC as a member of the club's USSF DA coaching staff after serving as Director of Coaching at Georgetown Force FC from May 2010-May 2016. Under his leadership, Force FC doubled in size and had the most players in the club's history selected to South Texas and Region III ODP teams. After moving to Austin in 1998 from Washington, DC, Ron began his coaching career at Austin Capital SC under the tutelage of Wolfgang Suhnholz. In 2008, Ron was hired to help launch Austin's professional soccer team the Austin Aztex where he held various positions. From 2013-2015, Ron worked as Head Coach for APPA (Academia de Preparacion Profesional de Austin), an Austin Hispanic community soccer academy that identifies and prepares local talent for trials and training with professional teams in Mexico. Over the past 20 years coaching in Austin, Ron has helped develop and guide many Central Texas players into the college and pro ranks. Ron grew up in South Florida and was a graduate of Coral Springs High School in 1990. He is married to LiAnne and has two children, Toren and Wilder.